A direct link between Cubist Art and Cubist Architecture does not exist. However both share the same characteristic of dealing with geometrical shapes and forms. Often Cubist Artists painted abstract objects, as dissected geometrical shapes. Often buildings, based on Cubist principles, are designed as geometrical interlocking shapes or quite simply as a single geometrical shape. This can be seen in the buildings shown below. Each of the buildings has a basic geometrical design, often a cuboid shape. Simplicity is often an overriding characteristic. Modern materials have been used, often materials not normally used in the construction of buildings. The buildings have sharp, clean lines, ensuring that the building is viewed in perspective with ease. Cubist buildings are often designed to be manufactured as prefabricated buildings and moved from the factory to the building site where they are assembled. The windows have a cube / rectangular form and do not necessarily line up with each other, as in traditional / conventional buildings. Subtle colours dominate the design, with one or two colours prominent. Designed with an open space interior. Shapes of windows and doors in harmony with the shape of the building. Designed to fit into the urban environment. Prefabricated and assembled on site. Conventional design. 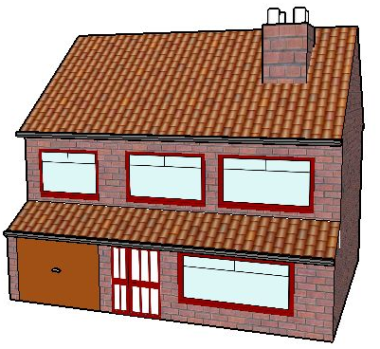 Traditional materials - red brick, tiled roof.. Traditional design, from the 1920s. Three houses designed on the principles of Cubist Architecture, are shown below. They are each based on a geometrical shape called a cuboid. Study their features/characteristics carefully. Complete the design for a small family home, at the bottom of the page. The basic geometrical shape of the building has been drawn for you. Remember, the building should be designed with Cubism in mind. Suggestion: Look at the style of the three sample buildings before adding detail to your design.